The nine different models in the Bass Action family, provide tools for everything from a weightless worm, spinnerbait to medium-depth crankbait applications. By utilizing a new proprietary scrim in conjunction with TFO's high modulus carbon fiber blank material, Gary was able to save weight and increase sensitivity without sacrificing strength. GTS Bass blanks are tastefully finished; simply polished, with a thin layer of matte clear coat to enhance the natural luster of the fibers, TFO's trademark Color ID Split grip is further complemented by a two-piece reel seat and a natural cork ring split grip. GTS rods are topped with TFO's proprietary Tactical Series guides, machined stainless steel inserts are super-hard chrome anodized then swaged into a chromium-impregnated stainless frame. What does this all mean? Super hard, super slick, saltwater safe and no more lost fishing time due to lost inserts...and they're 30% lighter than standard SiC guides. 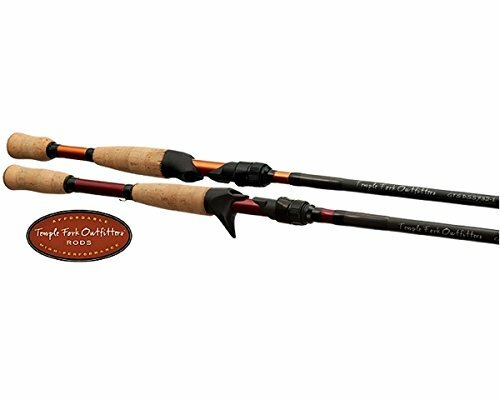 Gary Loomis Tactical Series 1 Piece Bass Casting Rod - 6'9"
Power: Medium High, Action: Fast, Line Wt: 8-17 LB., Lure Wt: 3/8 - 1 OZ. GTS Bass blanks consist of TFO's high modulus carbon fiber blank material, simply polished, with a thin layer of matte clear coat to enhance the natural luster of the fibers. GTS rods are topped with TFO's proprietary Tactical Series guides, machined stainless steel inserts are super-hard chrome anodized then swaged into a chromium-impregnated stainless frame. Super hard, super slick, saltwater safe and no more lost fishing time due to lost inserts and they're 30% lighter than standard SiC guides.